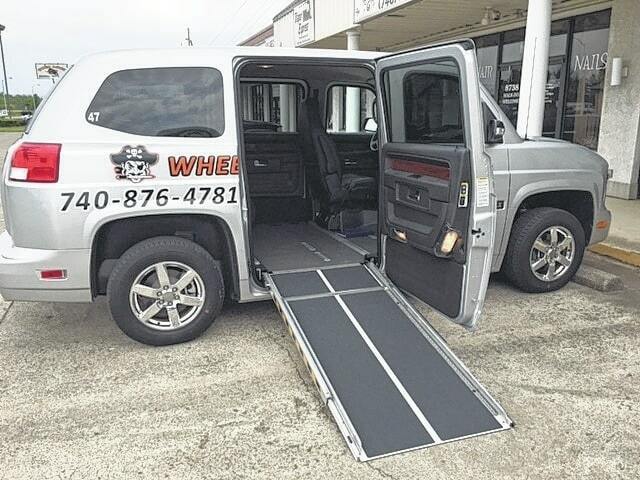 Access Scioto County (ASC) Transit Coordinator Larry Mullins announced this week that ASC’s Wheelersburg Dial-A-Ride has received a new vehicle. The unique looking vehicle is a Mobility Ventures MV-1, which is the first vehicle to be designed from the ground up to be wheelchair accessible, according to Mullins. Mullins added, The MV-1 is built at the AM General assembly plant in Mishawaka, Indiana — the same factory that manufactures Humvees for the military. According to Mullins, the MV-1 is a 2014 model, however it had been used as a demo and had only 13-miles on it when purchased from Shepard Brothers, Inc. of Canadaigua, NY. The original invoice price for the MV-1 was $51,506, however ASC was able to purchase the vehicle for $36,920, according to Mullins. “The funds to purchase the vehicle came from our savings we have realized during the past few years by switching to using propane Autofuel in our main fleet of buses and from Alternative Fuel Tax rebates,” Mullins said. “We feel that the MV-1 is better choice for our Dial-A-Ride service and will help us serve the people of the Wheelersburg area better,” Mullins said. For more information please contact ASC Coordinator Larry Mullins at 740-353-5626, extension 208 Note: The Wheelersburg Dial-A-Ride service operates Monday – Friday from 8:00 a.m. to 4 p.m.
Access Scioto County (ASC) Transit Coordinator Larry Mullins announced this week that ASC’s Wheelersburg Dial-A-Ride has received a new vehicle. The unique looking vehicle is a Mobility Ventures MV-1, which is the first vehicle to be designed from the ground up to be wheelchair accessible, according to Mullins. Mullins added, The MV-1 is built at the AM General assembly plant in Mishawaka, Indiana — the same factory that manufactures Humvees for the military. According to Mullins, the MV-1 is a 2014 model, however it had been used as a demo and had only 13-miles on it when purchased from Shepard Brothers, Inc. of Canadaigua, NY. The original invoice price for the MV-1 was $51,506, however ASC was able to purchase the vehicle for $36,920, according to Mullins. “The funds to purchase the vehicle came from our savings we have realized during the past few years by switching to using propane Autofuel in our main fleet of buses and from Alternative Fuel Tax rebates,” Mullins said. “We feel that the MV-1 is better choice for our Dial-A-Ride service and will help us serve the people of the Wheelersburg area better,” Mullins said. Note: The Wheelersburg Dial-A-Ride service operates Monday – Friday from 8:00 a.m. to 4 p.m.